Ellen and Doug in rehearsal. Enjoy this insight from Dramaturg Ellen “Dash” Walter on her collaboration with playwright Douglas Carter Beane. Villanova’s Graduate Theatre Department offers an outstanding annual platform for a student dramaturg to work alongside a playwright of stature in developing a new work in the early stages of creation. Because every playwright has a unique way of creating, this process cannot be clearly defined ahead of time, which provides the potential for a wonderful adventure. In this instance, it proved enriching to serve as dramaturg to a playwright who has been my friend since elementary school. Doug and I wrote a play together in sixth grade that featured the sound of a toilet flushing and a joke by the king about a ‘royal flush.’ We went on to work together performing in numerous musicals during the 1970s at Genesius Theatre in Reading, a period about which Doug penned his play Shows for Days starring Patti LuPone, that ran off-Broadway in 2015. We wrote several musicals together during the 1980s in New York as members of the ASCAP Musical Theatre Workshop, performing songs and scenes from their projects for panels of mentor-luminaries including Stephen Sondheim, Marvin Hamlisch, Stephen Schwartz, John Kander and Fred Ebb, Hal Prince, and Charles Strouse. Doug and I came of age together during the 1970s just outside Reading, PA, so when he decided to set the play in 1972 in the very same building where we attended school, I knew the worlds of the play would evoke vivid memories of people and events we held dear in our mutual memories. The first task I embarked upon was to photograph West Reading and the old West Reading High School that served as our then-merged school district’s middle school. Doug asked me to try to get in to shoot the science room, art room, and auditorium, but low and behold, I arrived to find the building had been converted into apartments. That setback, however, turned into a boon when we had to rely on our memories. Doug remembered dissecting frogs in science class and I remembered a skeleton model in the classroom. Both images morphed into the Frog and Skeleton characters in the living art sections of the play. I continued the local research by visiting the West Reading Borough Hall, two libraries and our old high school which housed all of the historic yearbooks. 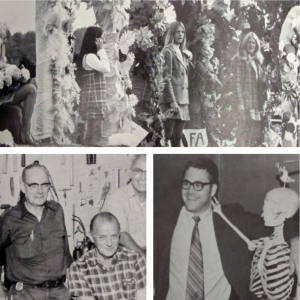 How funny to page through the dusty volumes of old photographs of drama club productions, neighborhood friends, memorable teachers and staff, and unforgettable hair and clothing styles of the day. Doug lovingly wove some of these references into the characters and mise-en-scène of the play, forever memorializing snapshots of our shared youth. I especially enjoyed creating a still-evolving Glossary for the actors, because there were so many cultural and historic references in the play. In addition to biographic and visual research on the many artists woven into the play’s tapestry, there were Hollywood celebrities like Agnes Moorehead and Don Rickles, local TV celebrities like Gene London, pop culture references like the Partridge Family and Soul Train, Eastern Pennsylvania-centric nods to Amish distelfinks and the old Two Guys store, and the list goes on. 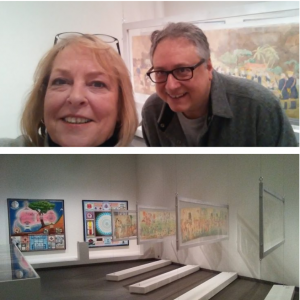 Doug and I spent a day at the American Folk Art Museum in New York, where the curator gave a tour of the new Outsider Art exhibit that included work by Henry Darger and drawings by A.G. Rizzoli, two inspirations for Teddy’s character. Later that same day, we had a meeting with a professional psychologist who offered detailed insights into aspects of the schizoid personality, a psychological challenge faced by Teddy’s character. 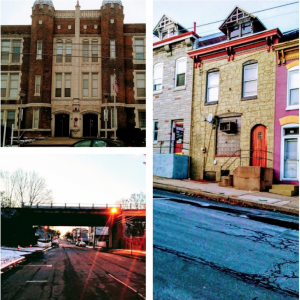 The playwright – dramaturg adventures continued as we spent a day in Philadelphia strolling Pine Street and taking photographs of galleries and houses that inspired those locations in the play. Doug shared his early memories of the area, pointing out details that have either changed or remained. The most exciting aspect of the play’s development has been the workshops. 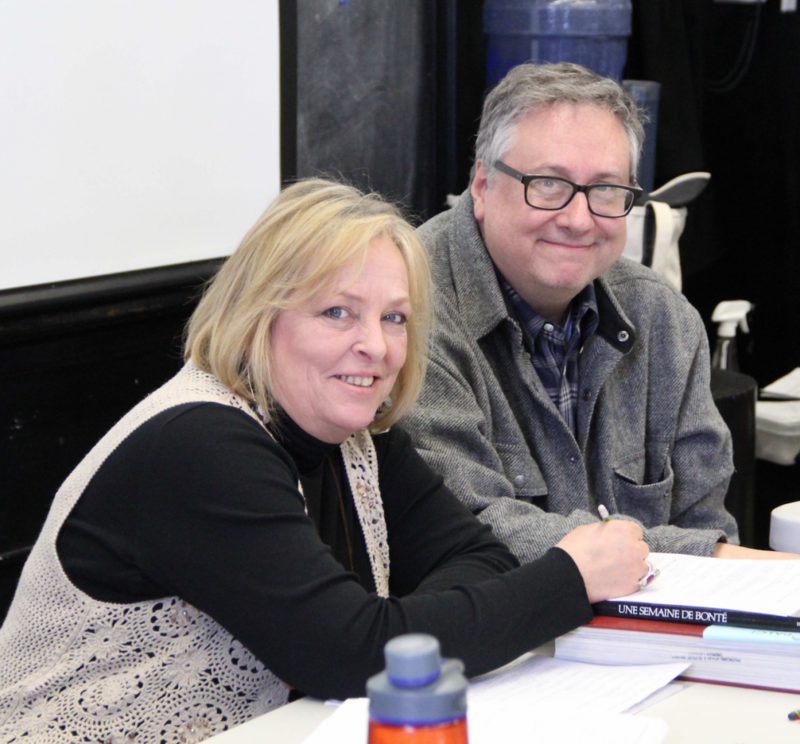 Because Doug is working as both playwright and director for this reading, he is able to shape and sculpt the play in the living theatre with the help of so many of the talented Villanova theatre graduate students. Doug’s disarming humor and adoration for the educational process has given the cast, production team, and this dramaturg a practical learning experience we will never forget. It’s such a joy to be collaborating again with my lifelong friend and sharing this ride with him into the depths of The Behavior of Light. Ms. Walter is a second-year graduate student in the Villanova Theatre Department. She graduated from Syracuse University with a B.F.A. in Theatrical and Film Directing with a minor in music. She has done post-graduate studies and practicums in Music Therapy at Tennessee Technical University and Nonprofit Management at Harvard University. 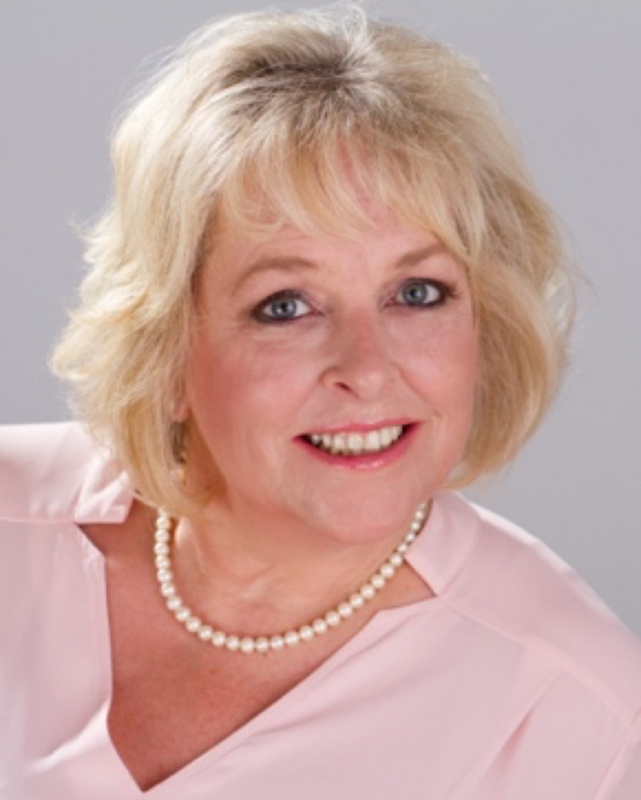 Ellen has worked on five original Broadway productions assisting Harold Prince, Alan Jay Lerner, and Charles Strouse; conducted the Tulsa Philharmonic and regional musicals; founded and conducted the World Peace Choir; produced and directed a variety of national television commercials, music videos and documentaries. She is an accomplished pianist and singer and has worked as an entertainer in New York, Nashville, and Newport among other places. Ellen was Artistic Director for the List Academy of Music & Arts in Newport, Rhode Island for six years, and served as the Vice Chair of the Newport Cultural Commission. She lived in India for eight years where she was the Head of Department for Visual and Performing Arts at Kodaikanal International School, where she taught IB Film, drama and musical theatre and Head of Department/Senior Faculty for Film, Speech & Drama at Singapore International School in Mumbai.